Well, it’s finally done. I’ve sewed the last piece of jersey on my sewing table into Vogue 1087, another design by Donna Karan. 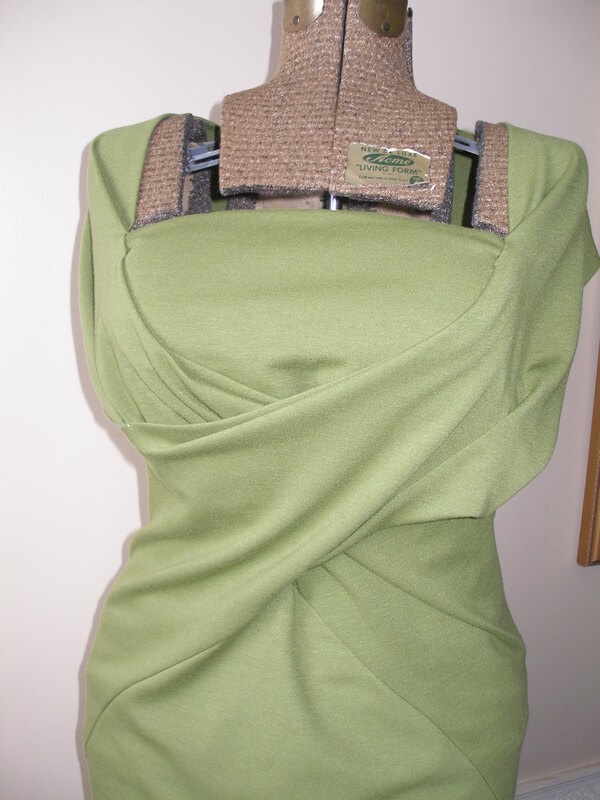 I used a piece of lovely autumn green RPL – it’s got some substance, and this dress is unlined. I’m hoping the slightly heavier knit will take this through the fall – and perhaps the winter – with a jacket. I really liked the draped front of the dress, and the bodice! No worries about a wardrobe malfunction here. That said, I’m just really liking DK’s designs lately – they just suit a woman’s body and take away a lot of the STRESS of looking put-together. I did some alterations, but I didn’t do an FBA given the stretch of the jersey – I thought it would give me the extra couple of inches I need. 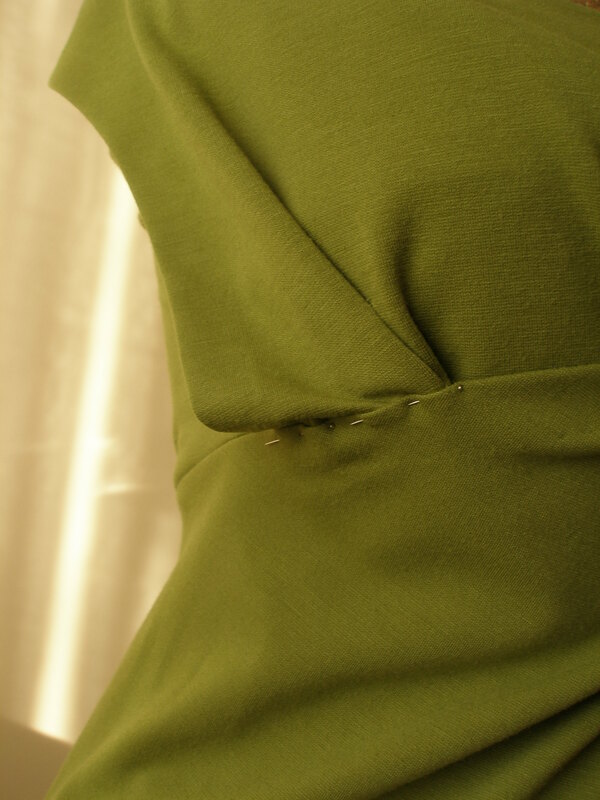 I did shorten the bodice back 2″. I’ve drawn red lines where I made my adjustments. I only shortened pieces 1 (R front & back) and 2 (L front & back) by 1 inch instead of the 2″ on piece 5 (bodice back) because of my usual bust length requirements. I also cut the waist and skirt up one size. I cut the bodice front (piece 4) one size bigger than usual instead of doing the FBA – I just wanted to make sure I had the width I required. The markings on the patterns are detailed and accurate – I made sure I marked every single one meticulously – and they went together well, with the exceptions noted below. There is a lot of hand stitching. All the armhole edges and the wrap front edges are hemmed invisibly. I chose to use a tiny catchstitch because they’re secure yet flexible, and, well, knits move around! Well, I followed the instructions to the letter (and diagram), and they made perfect sense and the garment went together beautifully. I really had no “HUH?” moments until I put the half-finished garment on my dress form. And this is what I noticed: On the pattern front, the left side wraps over top of the right side. But even though I followed the directions P.E.R.F.E.C.T.L.Y., my garment wraps the opposite way. I think I studied the instructions and re-did the steps about six times, just to make sure that I followed them correctly. I did. Either the instructions are backwards (and so are the pattern pieces) or the pattern envelope image was flipped. I tried changing it around, but the two front pieces are cut slightly differently, so I decided to just leave it. Who in the world is going to notice, anyways? As I mentioned previously, there are a lot of unfinished edges in the garment, and three steps leave out finishing instructions altogether. At Step # 9, the pleat on the left front (R front, in reality) side is only basted. This leaves a very large mess once you get to Step # 13, so I stitched the pleat from the inside of the garment, not from the outside, overlapping the edges to match the markings as the instructions would have you do it. 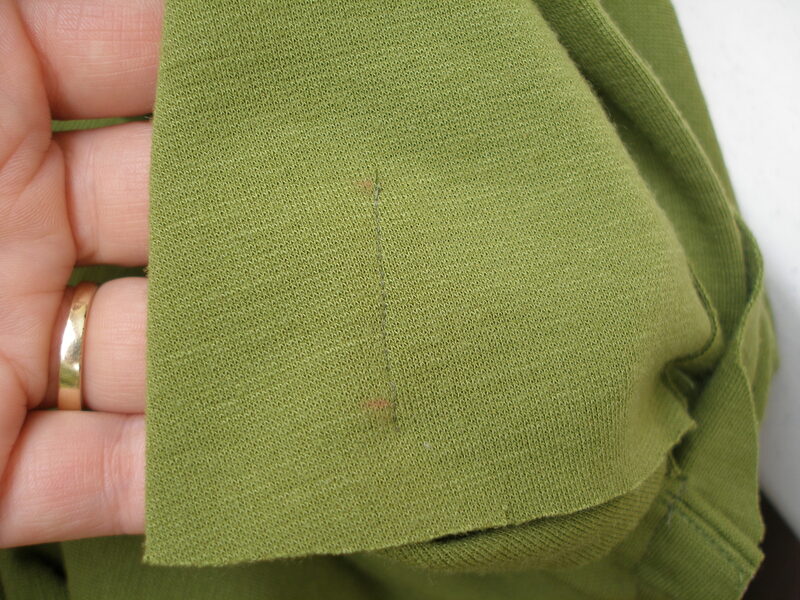 Then at Step # 13, the instructions simply have you stitch a seam about 1 inch long to tack the front and back together. 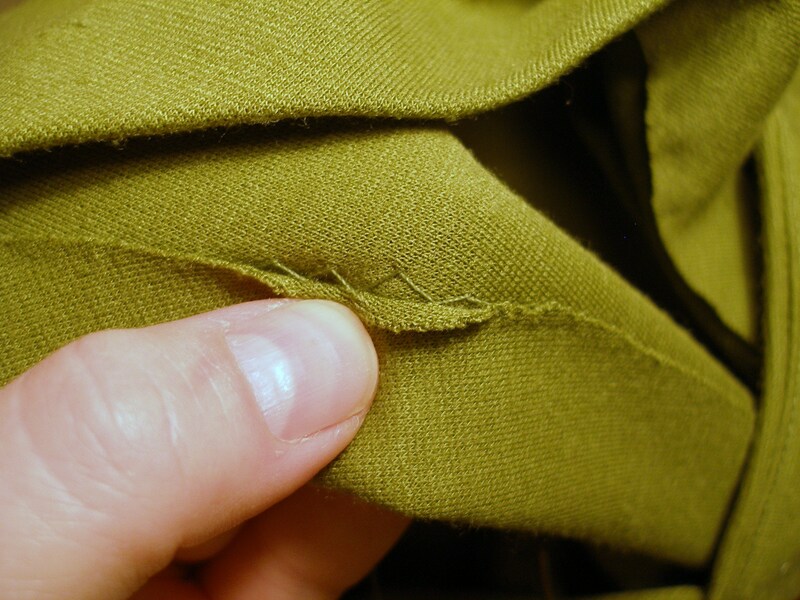 If you follow this to the letter, the edge of the pleats (where the stitching is) hangs loose and is in danger of being in constant view to whoever is looking at you. 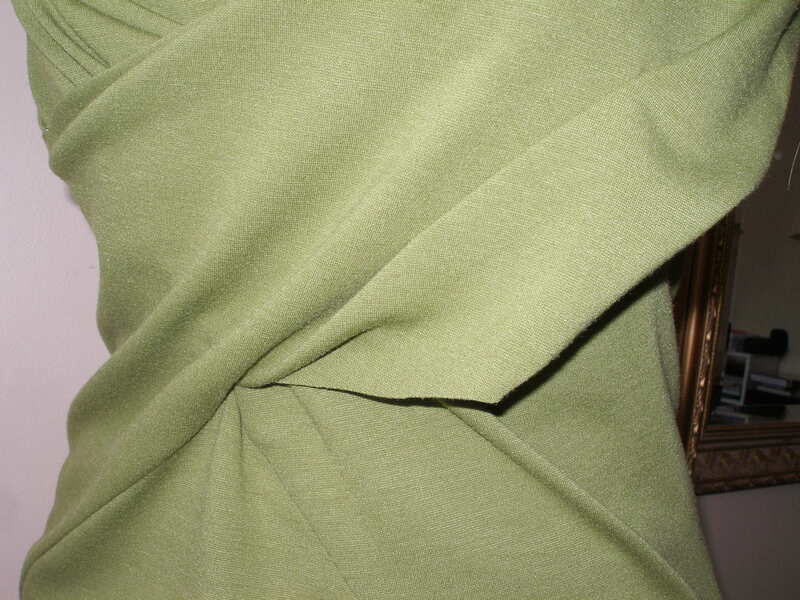 So once the garment was complete, I fell-stitched the R front edge over the pleats and loose edges. There is also no indication that the edge of the R front should be hemmed…. …. but I did, because I didn’t want that raw edge waiting for a chance to exhibit itself. The last little bit of finishing that’s left out is in Step # 31.
just press in the armhole edge?!?! So I invisibly hemmed the back armhole edges on both sides to hold them in place and give the garment a clean look. All the seam allowances in this garment are unfinished. I don’t think this will bother me because the RPL is quite stable, and after abusing a piece of it horribly in the hope it would disintegrate and fray around the raw edges (to no avail), I decided to leave the edges unfinished. I must confess I’m not crazy about a completely unlined dress. I usually line all my dresses, even if it means I draft my own lining, so wearing this will be an adventure. The skirt is quite snug – you can tell from the pattern envelope. I think it’s a nice snugness, but if you’re a bit shy about it, cut the skirt up a size. The bodice is VERY generous. Remember I cut it one size bigger to accommodate my non-existent FBA? Well, I ended up cutting it down a full size, and it fits me perfectly. Make a note of this! 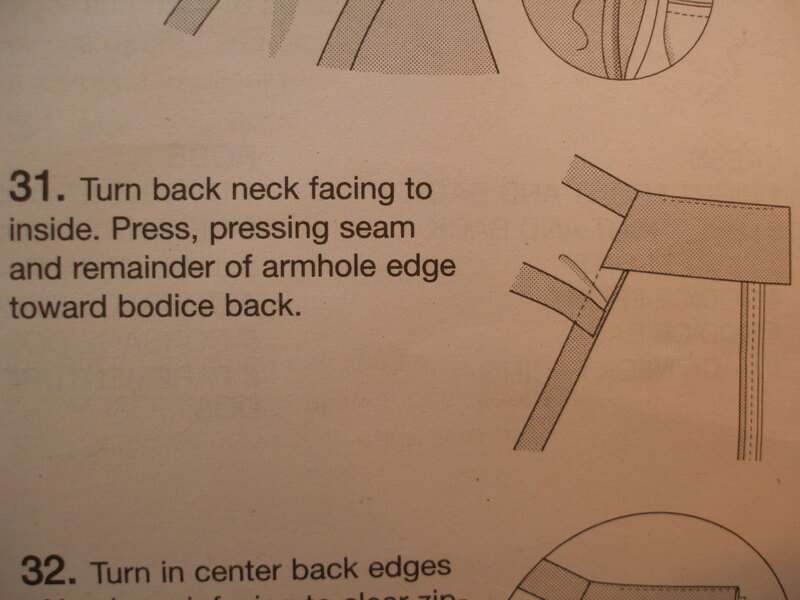 I always need to do a full 1 inch bust adjustment on a pattern, but this one does not require it. 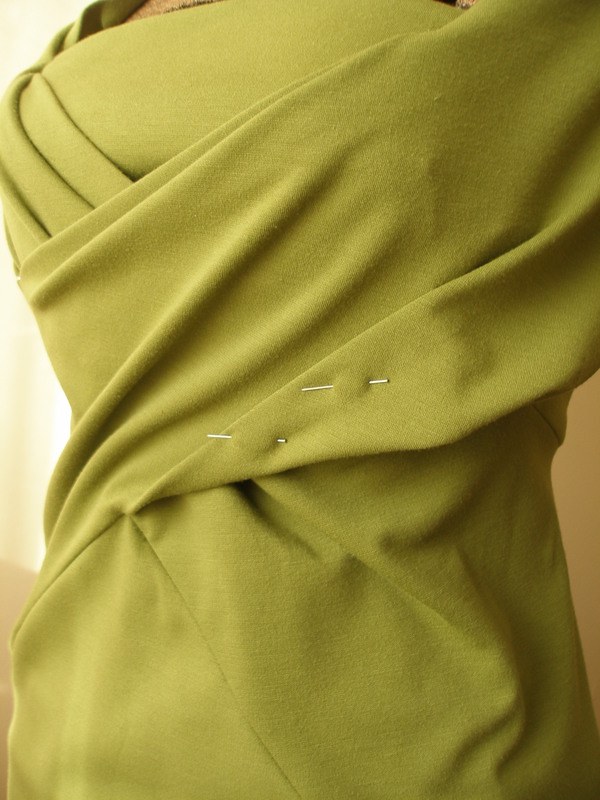 The bodice hangs loose on the inside – this could be annoying, depending on you. 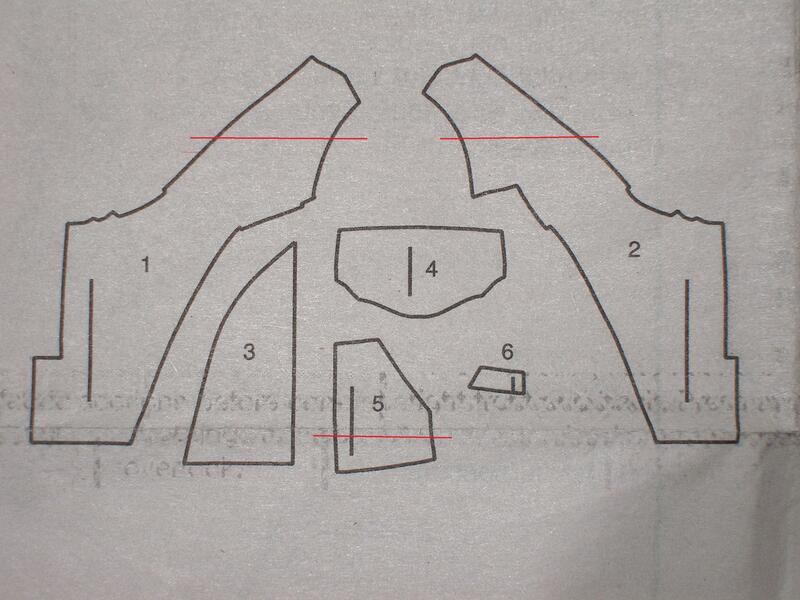 The bodice piece is not symmetrical. Some reviewers trued up the bodice, but I didn’t bother. I’m not symmetrical by anyone’s definition, and the asymmetricality (is that a word??) of the bodice worked on my asymmetrical body. Would I make this dress again? Yes, because the fit is unbelievably flattering, and I was pleased with how it turned out. Would I recommend it to others? Yes, if you’re willing to take your time and do a lot of hand finishing and use your experience to fill in the gaps in the instructions. 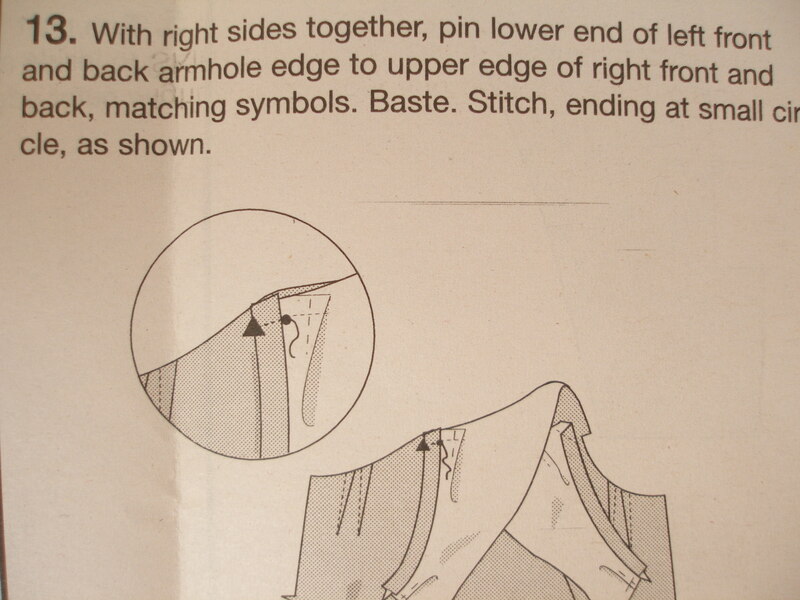 The pattern is rated “Advanced”, which I’ve always found to mean Vogue is giving you the basic order of construction with some special notes about oddities of the design, but they expect you to be able to fill in the gaps with good dressmaking or tailoring techniques. I just discovered your blog. Wow! What an amazing seamster/seamstress/sewist you are. I love this dress. As a matter of fact I love everything you’ve done. I just went to PR to check out your reviews. So I am giving you a warning right now, I will be visiting your blog very often. I love your tips. Thanks so much for the Vogue FBA explanation. Great post! I love being taken through all the little points of interest when sewing the pattern. 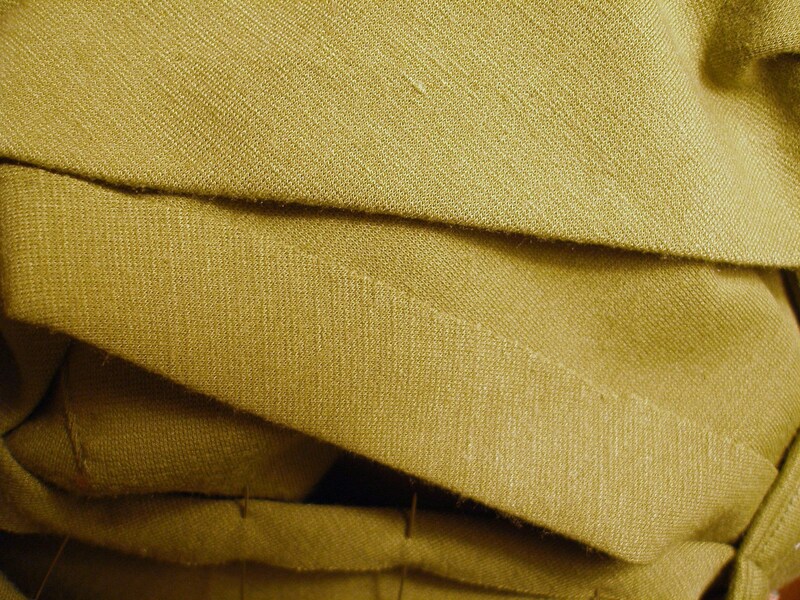 The colour green of your fabric is so pretty and appealing for Fall. I hope you will post a picture of yourself wearing it. I’d love to be able to wear a dress like that, but sadly I am more pear than hour glass, lol.